The hospital standardised mortality ratio for Lincolnshire hospitals rose in the last year, with Lincoln County Hospital scoring significantly higher than expected. The United Lincolnshire Hospitals Trust hospital standardised mortality ratio (HMSR) score for the most current rolling year to March 2015 was 107.63. Lincoln County Hospital had the highest rating of ULHT hospitals of 121.86, compared with 97.66 at Boston Pilgrim Hospital and 84.9 at Grantham and District Hospital. HSMR takes into account the type of hospital and the treatments and operations it offers, adjusting crude mortality rates and adjusting them for a variety of factors including population size, age profile and risk level of treatments and operations provided. Nationally, the expected HSMR score is set at 100. HSMR is just one of a number of indicators used to monitor care quality across the trust, and trust directors say it does not reflect the actual number of deaths. The figures, as part of a quality report presented at a ULHT board meeting on Tuesday, September 1, show the percentage of patients who have died in hospitals in Lincolnshire has decreased consistently this year to 1.27% in July. Annually, this figure has fallen from 2012, when mortality was 1.84%, to 1.73% in 2014. 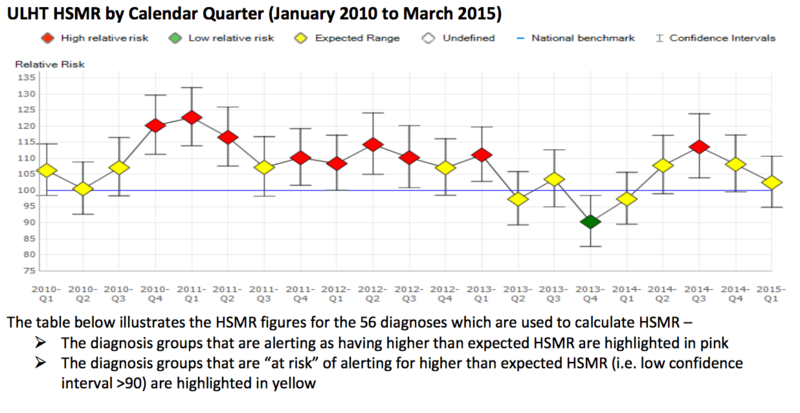 ULHT Medical Director Dr Suneil Kapadia said: “We are all aware by now of the limitations of using HSMR, which is not associated with avoidable hospital deaths. “Nevertheless, we still examine closely all diagnostic groups where ratios are high. Our aim is to treat all quality indicators properly and make sure they lead to improvement in the way we care for patients. “At Lincoln County Hospital, the HSMR has historically been higher than our other sites. However, the proportion of patients who are admitted there and die, remains low and comparable to the other sites. “A difference in HSMR between sites can occur due to a number of variables including several which are unrelated to mortality. The trust recently came out of special measures following an inspection by the CQC which rated 83% of services as ‘good’. The mortality rate has fluctuated over a number of recent years and the recent recoded rise comes after the trust recorded its lowest score in five years.